The right balance between the role of the state and the market is key for susccesful development. In this video, Joseph Stiglitz explains why they should complement each other. This video was recorded at the UNU-WIDER 30th anniversary conference in Helsinki in September 2015. 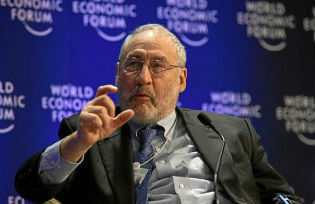 Joseph E. Stiglitz is an American economist and a professor at Columbia University. He is also the co-chair of the High-Level Expert Group on the Measurement of Economic Performance and Social Progress at the OECD, and the Chief Economist of the Roosevelt Institute. A recipient of the Nobel Memorial Prize in Economic Sciences (2001) and the John Bates Clark Medal (1979), he is a former senior vice president and chief economist of the World Bank and a former member and chairman of the (US president’s) Council of Economic Advisers. In 2000, Stiglitz founded the Initiative for Policy Dialogue, a think tank on international development based at Columbia University. He has been a member of the Columbia faculty since 2001 and received that university’s highest academic rank (university professor) in 2003. Based on academic citations, Stiglitz is the 4th most influential economist in the world today, and in 2011 he was named by Time magazine as one of the 100 most influential people in the world. Known for his pioneering work on asymmetric information, Stiglitz’s work focuses on income distribution, asset risk management, corporate governance, and international trade. He is the author of numerous books, and several bestsellers. His most recent titles are The Euro: How a Common Currency Threatens the Future of Europe, Rewriting the Rules of the American Economy: An Agenda for Growth and Shared Prosperity and The Great Divide: Unequal Societies and What We Can Do About Them. His latest book, Globalization and Its Discontents Revisited, will be released in November 2017.